In 100 aphoristic statements, his manifesto exposes how forces for human connection have turned into ones of isolation and repression: Money, for example, has transformed from a means of exchange to a means of exploitation, and education has become an extension of occupational training. Digital-age technologies have only amplified these trends, presenting the greatest challenges yet to our collective autonomy: robots taking our jobs, algorithms directing our attention, and social media undermining our democracy. But all is not lost. It's time for Team Human to take a stand, regenerate the social bonds that define us and, together, make a positive impact on this earth. A clear, resonant clarion call for us to reassert our common humanity & reclaim our original inheritance. Rushkoff is in top form and we need his wisdom now more than ever. 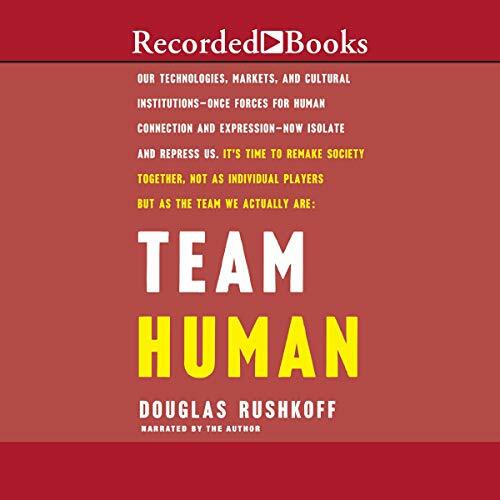 If you haven't been listening to podcast Team Human by Douglas Rushkoff--the great techno guru of the 90s who has now become more of a skeptic and the social consciousness of the silicon era--do so now. Full of brilliant ideas and dialogues about our current confusing era. Then, after listening to most of the archive, get the book Team Human. To be honest, it's rather light for Rushkoff. To delve deeper, try Life Inc. or Throwing Rocks at the Google Bus. Team Human could be accused of oversimplifying a host of issues, but the book does provide a valuable service by summing up the ethos that humanity needs to start living by if we are going to survive the digital landscape that we are in. These things do need to sorted in an orderly manner, like a manifesto or at least a starter, so that well-meaning people will have a foundation to fall back on. Much of the book is fascinating, on the connection between computerized media and nationalism as opposed to the unifying nature of other mediums. On the absurd abstraction of the economy, and how we must care more about the foreground and not be lost in the background. Why the Renaissance, which takes in positive old ideas, is a better metaphor for the state of the world than 'revolution', which always ends up with the same power structures in the end. There is even an analysis about how story structure in cinema has warped people's expectations of reality, and even gets into the cyclical nature of time in cultures both pre- and post-agriculturalism. And my personal favorite, the dangerous concept of mechanomorphism in which humans start imitating the machines. Amazing food for thought from every food group. It draws nicely from many wide ranging topics and concepts. While being so great at pointing out the essential flaws that recur so timelessly it somehow still glosses over how we're supposed to start working better to get along on team human but great insights and questioning. More of a manifesto — extended ranting and riffing that adds up to a sort of an anticapitalist, leftist goulash. My sentiments are with him in general so, up in my place in the choir, I was okay with being preached at, but I can’t honestly say I remember a single well supported argument for any position he outlines here. It didn’t help my impression that in the one area where I have expertise — audio engineering and music recording — he perpetuates certain canards in a comical fashion, and let’s just say, he has little idea what it’s really like to play in a group in a recording studio. (Much less alienating than he implies.) All the same, I share his alarm at the current state of the world and I don’t think he’s wrong, broadly speaking. His call to “find the others” is well taken. the author definitely has a very interesting perspective on many different things in our society. Very thought-provoking.